The Cabela's Downtown office (Justin doesn't work here) Main street looking West Main Street looking North...our home is sandwiched between two railroad lines We're here!! The Post Office!! Cool old mail boxes This morning Amelia and I walked to the Post Office to mail some letters. I realized there aren't any photos posted showing our new town. We live near the center of town (about a block away). Here are some pictures along the way!! Today was fun. We had a day off from the gym so what did we do...our next favorite thing...go to the laundromat. Once a week ended up taking too long and too many loads. Between loads we went out for lunch with half the ladies from Relief Society at Oya Grill. About 4 ladies celebrated birthdays this week so we all went out to celebrate. Oya made me really miss good Mexican food. My entree was ok, but no Cafe Rio. Amelia spilled water everywhere and commanded the salt shaker. She is so funny, the lady sitting next to her heard all about how much Amelia loved the rice. She patted her cheek to get the lady's attention! Alison came over after school was over to pick up two cute shirts for her little girl, Ella. Ella is about a week younger than Amelia. It was fun to have her over even for a second. Amelia woke up while Alison was over. She acted all shy but hyped up on goof balls at the same time. She managed to get her hat on and one coat sleeve on by herself. I guess Amelia thought she was going somewhere. After Alison left we pulled out the stroller and walked to the Salvation Army just a block away. It was so cold and the roads were totally slushy, not the best stroller weather. At the SA we found an inflatable booster seat for $3.50 (like the one Miekka has), brand new shoes for Amelia for a $1, and the coolest HORSIE ever pricing in at $3. Amelia rocked on the horsie for 10 minutes. It was light enough that I ended up buying it and carrying it home with the stroller in one hand the horse toy in the other. Amelia was SO hilarious with the horsie. While I was cleaning up dinner she ran into her room and grabbed Mimi. Then she put Mimi on the horsie. I heard her telling Mimi, "No, no Mimi, bad mimi." She carried Mimi over to the time out wall and plopped Mimi down, then sat in front of Mimi. I continued to hear "no, no Mimi, Mia's horsie." After the requisite 1 minute in time out she gave Mimi a hug then mounted horsie by herself. I about died laughing. Justin was on the phone with me at the time so he heard most of it blow by blow. What a funny little critter. VIDEO:Click here for video with the horsie, playing "head, shoulders, knees, and toes", and saying elevator. WaHoo!!! I am doing the vacuum dance right now!! I had J-dawg email the lady at work in charge of the "new people" about getting another chair and a vacuum. She delivered the two items today PLUS a mop for the kitchen floor. I am so excited. The chair is bar level so is way too tall for the table, thus the new chair is now Amelia's. We can eat meals as a family. I filled up half the vacuum chamber vacuuming the living room floor. Yikes...it was mostly due to me and my crafting remnants. Amelia helped by crumbling cookies, cereal, and crackers all over. My heart feels bigger having one small prayer answered. Thanks to Justin for actually emailing the lady and props to the lady for delivering. We have Internet issues. Yesterday the Internet was down all day long. I made 6 new shirts to sell and made a trip to Walmart. We had lunch with Daddy at McDonald's mostly to get out of the house. It was sunny yesterday and a balmy 7 degrees outside. Justin said his hands were almost frostbitten in the morning trying to scrape out his car, the weather station reported it was -12 degrees that morning. We stopped by Cabela's to purchase some gloves for me since they were packed with just about everything else we own. It felt nice not to have icy fingers!! Tuesday evening our ward hosted a baby shower for two ladies who will have babies in the next month. There was a delectable spread of food, I resisted and munched on my apple instead. Amelia did not follow my train of thought and instead ate some "birthday cake," which is any cake looking dessert. She recruited one of the girls to play ring-around-the-rosies with her for a full 20 minutes. Then she decided to dish out hugs to me, the girl she played with, and an unsuspecting and ungrateful toddler. As Amelia hugged the toddler, the toddler had the most delightful horror-struck face. She skedaddled as soon as Amelia released her. Everyone loved my cute little infant shirts, an apple and a cherry shirt for the little newcomers. This morning Amelia and I tried going to the gym at 9:30 am. This arrangement worked a little better. Amelia was not thrilled at all to go to hourly daycare, but she went anyways. Maybe we need to build a little character in that little girl. Naw, she has more than enough character!!! After my workout we played in the gym with balls and hoops for an hour, mostly to make up for my conscience. Jeff called while we were playing. It was awesome to hear his voice! He should be stateside soon. Sunday afternoon Amelia tried to put her pants on all by herself! She succeeded in getting both legs through a leg hole!! Goodness she is growing up so fast. We snuggled in after church on Sunday to watch the snow come down. It continued to snow all Monday also. The snow was thick enough that school was cancelled. Justin was disappointed work was not also cancelled. I tried getting up at 6:20 on Monday morning to workout. I know that is not early at all but it was too much for me at this time. The rest of the day I felt so horrible, it must have been an exercise-induced migraine. Weird huh?? I need to figure out the best time to go. Amelia and worked on laundry mid-morning. The snow was really thick when we finally finished. I could almost imagine the mountains hugging us since the visibility was only about 10-15 feet. LOL. I am a bit homesick and really wanting my stuff back. This week I discovered we don't have a stinkin' mop. I was on my hands and knees scrubbing the floor with a sponge. After church today Amelia decided the snow on the car bumper was pretty yummy! She licked most of it off the bumper! Good thing she looks like a cute elf. I am really trying to turn on some creative juices here in Sidney. Last summer I bought about 40 shirts at Walmart for $1 per shirt. 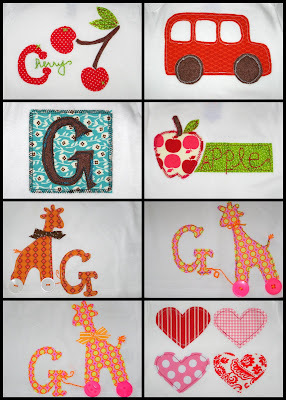 Now I have the time to make the shirts into cute little appliqued numbers to sell at the next craft fair. At the laundromat, the owner said there is a fun craft fair at Oktober fest each year. That time frame did not make me want to rush home and work on the shirts. Thanks to Trissha, she let me borrow a table and chair so I could sew the shirts up better than on the floor. 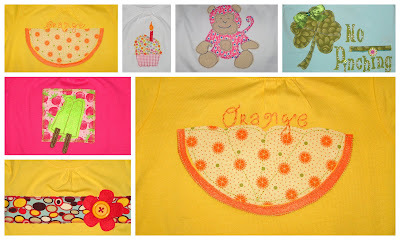 I had no excuse...so I whipped up 8 cutie pie shirts on Thursday and Friday. Good thing because the warmish weather is now about 15 degrees and the sunshine changed into snow flurries. Amelia helped me pick out fabric and use my scissors on her toys. Yesterday I was feeling pretty yucky so what did I do? I got a gym membership. That took me a couple hours since part of the process included getting a signature through Cabela's HR. Amelia showed off her cutie cutes to Justin's co-workers. She perked up if they offered her candy. I was able to meet Stan and some of the the other people J-Dog works with. He even decorated his office with various pictures he's collected over the years. My bridal picture is right by his phone so when he calls me I am staring at him with doey eyes! LOL. I love it. 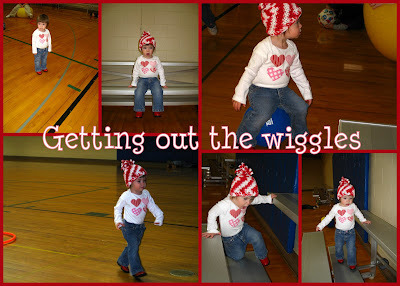 By the time we returned to the gym, paid, and put Amelia in hourly daycare I was so tired. The thought of doing the lazy dog on the gym floor sounded awfully tempting. Amelia went straight to daycare because the ladies were serving lunch of mac n'cheese and broccoli...her favorites. They said once she finished eating and realized I was gone she raced around like a trapped monkey looking for an escape hole. I did pull myself together and exercised on the elliptical machine for 45 minutes. This morning we contacted a realtor who took us around to see 4 homes. We saw a newly built condo, a 1940's home that smelled like bleach and mold, another 1940's custom built home with awesome wood work, and a 5 year old home that was bigger than it looked. I can't wait until we can really make a decision WHEN our home in Utah sells. The carpets should be getting a nice cleaning today, thanks to Charity! We miss our Utah crowd so much. Guess all the cold weather is making me miss you all. We had a really lazy morning. Justin woke up several times during the night with food poisoning. Poor guy was puking his guts out this morning! Makes me nauseous just thinking about it. I am glad he listened and went back to bed for a couple hours. Amelia and I watched PBS kids for an hour or more (yikes) to reduce making too much noise. I pulled Justin out of bed at 10 am and he went to work. 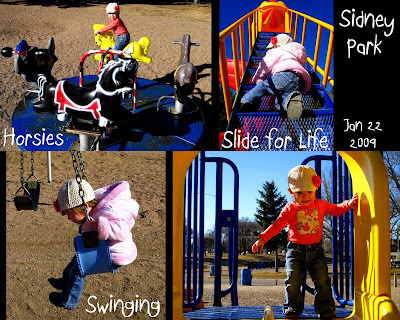 Amelia and I enjoyed the sunny, windy, and sort of warmish day at the park for an hour. Amelia loves the horsie merry-go-round. She also climbed a really, really high curvy slide and went down all by herself. Like an anxious Mom I was right behind her when she climbed the stairs up to the slide. It was a bit scary for me to watch her!! She cried all the way home because playing at the park was so fun. Poor thing was so tuckered out she almost fell asleep in her macaroni and cheese. I love sunny days with bright blue skies. Amelia recently started to refuse drinking out of a sippy cup. She prefers a big girl cup! She is growing up so fast. Here is a glimpse of Nebraska!! Yes...it is BROWN...FLAT...and WINDY! Amelia seems to like it, or maybe she LOVES the trampoline! Yesterday Amelia and I were outside playing in the driveway. She was playing with the rocks while I talked to my mom. I looked over to check on Amelia and discovered two sticks shaped in my (and Justin's) initials! It was so cool I had to get a picture!!! Maybe living in Sidney is fate! We are here in Sidney now! The packers swiftly packed our whole house on Thursday, they even packed my toothbrush and all my jewelry before I noticed they'd blitzed through my closet. It felt strange to walk through towers of boxes in our old home. I've moved quite a few times in my life (29) but this is the first time we moved since getting married. Amelia kept asking me to "put it back" when something was packed away. We had a birthday dinner at Mazza's for little Jacob on Thursday evening. James and Justin went shooting before dinner to try out James' new gun. Dinner was not so great...it was ultra garlicky and not a yummy as usual. The kids found a shelf to sit on after we finished eating! It was sad to say goodbye to Jana and the Lances. Amelia spent Thursday and Friday morning playing at Kate's house! Thanks so much to Catherine for watching her. Amelia already misses her friend Kate. She asked for her on Sunday at church. Bummer! Friday night we drove to Rock Springs, WY, only a 3 hour drive away. We ended up arriving there around 10 pm so that worked out well. All my houseplants died in the car due to extreme temperatures. I am very sad...at least the containers survived. Amelia very clearly said "elelator" on our way up to the hotel room. She was ecstatic to be free of the car. Thanks to Elmo, Curious George, and a portable DVD player the drive was not so bad. She watched a movie and I listened to Brisinger by Chris Paolini. We were on the road the next morning by 9 am. The drive was much better in the daytime. Wyoming landscape is so diverse! The wind kept a steady stiff pace most of the way. We only stopped three times between 9 am and 4 pm. Pretty good time with an energetic toddler. Once in Cheyenne the wind picked up to speeds of 25 MPH plus. Good thing the wind was with us, made the gas mileage jump up. Justin led the way to our little temporary home in Sidney on 1015 8th street. It feels quite large after living in a townhome with three levels. The home is only one level but bigger than the main floor of our SLC home. Without all our belongings to crowd out the house it is roomy. Amelia ran from the garage to the house yelling, "house! Isa House!" A lady from our new ward come over around 6 pm with a crib for Amelia we could borrow. Her room was completely empty, now it at least has a bed. We did not have much to unpack so everything was tucked away by dinner time. I made an emergency run Walmart for a couple things before Sunday. Sunday Justin met a guy he knew back from his days of living in 29 Palms. When you mix the military (esp the Marines) and the church the world becomes very small. There is also a descendant of Anson Call in our ward! Our new ward is small. The ward was created in July 08! Still there is a wide range of ages and families attending the ward. Most of the families with young children are consequently employed by Cabela's. The meeting was pretty exciting because the RS presidency was rearranged. The old RS is now the nursery leader. Phew, missed that change by a hair!! There are 6 nursery aged kids, most are nearer to age 3. One little girl, Bella is about a week younger than Amelia. I learned she lives a street over and a block down from us! During RS I thought someone was dancing the tango on the roof. Turns out it was actually the wind and a tree entertaining us. I am so happy Amelia is sleeping better than I expected. She is only waking up 1-3 times per night, which is pretty darn good considering her track history. I am so glad be brought all her crib stuff with us. It was worth the extra space. We are glad to be here. My first impressions of Nebraska are of the constant wind and flat, flat landscape. Sidney is built in a depression so it looks like the city is built in a hole! I am not sure this configuration reduces the wind! There are no mountains to channel the wind so it rakes everything along the prairie. Mountains of sage brush are tucked into every corner. We hope our home sells so we can settle down with our creature comforts here in Sidney. Here is the link to my new photography blog. I transferred all of the photography related stuff to my new blog. Hopefully, this one will load faster and not be prone to as many error loadings. My new blog is not password protected, so spread the word around. Friday after my phone took a dip Amelia and I went swimming at the local fitness center. Catherine and Kate were chummy enough to tag along! The girls had fun especially on Mr Pickles the Duck slide. It was really slick so we had to hold their hand as they zoomed down the slide. Once or twice we did not catch a hand which resulted in a head bonk. Amelia loved the water. She was blue-lipped before we finally cuddled up in a towel. Thanks for joining us Catherine! What a fun hour to spend having fun. Amelia and I drove over to watch a movie and eat pizza with Miekka and the boys. Amelia was sort of tired so we left earlier than planned. Saturday went by fast. De-bo came over for a minute to play with Amelia. My neighbors, Lucky & Brittany, invited us over for dinner at 5:30. Lucky is a superb meat roaster! He whipped up steak and two kinds of chicken for dinner. Amelia was fond of the broccoli and rice with a side of Reese's peanut butter cups. Lucky and Brittany came over to my house after dinner to see some of the pictures I took in Jordan. He is a sport's photographer so really likes to look at pictures. I will miss Lucky and Brit. They are good neighbors! Sunday we made it to church on time (no emergency outfit measures were needed). Amelia went to nursery by herself, but cried most of the time. She was very ornery the rest of the day. One day I hope she will enjoy nursery. It would help immensely once she goes to the same room, teacher, kids, etc. Each week is different in my ward here in Utah. It seemed a quarter of the ward was released and received new callings. Our boundaries were changed three weeks ago and part of our ward is now moved. James and Miekka invited us over for a baked potato bar dinner. After dinner we watched Extreme Home "Make-Out." It used to be a good show but now is mostly commercials and promos of some sort. The best part of the show is the last 10 minutes. I learned this weekend my phone is NOT waterproof! Friday afternoon I threw a load of laundry into the washer. Part of the load were my slippers, I tucked my phone into the slippers when I was upstairs. Once down stairs I developed a sudden urge to wash my slippers instead of wearing them. So they and my phone ended up going through the wash. While my phone was neatly being washed I kept thinking, "where is my phone?" I emailed Justin to call the dang phone so I could locate it. For some odd reason I kept ending up in the laundry room. Once I realized my feet were cold as well the whole phone in slippers connection finally clicked. Wow! It was super hard to be phone-less for even 12 hours. I can imagine how Justin feels without internet at home in Nebraska (no computer) and switching phones. My phone still weakly flickers with life when I replace the battery, but then goes haywire. The worst part is knowing all my contacts saved on that particular phone are lost! So, if I don't call you it's because your number was in my clean phone. At least it smells like downy!!! Catherine came over last night for an evening of making seasonal shirts for our girls. We mainly focused on Valentine's Day. She was super fast and completed 5 shirts while I barely scraped together two. I spent another hour today sewing and embellishing these two cutie patootie outfits. Luck of all luck, I found the heart pants at the DI...for $2! Yes! Catherine hurried over this evening to help me figure out how to finish the "Bee Mine" shirt. I had artist's block, actually a VERY NASTY headcold. Yikes! Amelia decided to wake up 7 times last night too. I feel pretty miserable. The normal medicinal routine (sudafed, nyquil, ibuprophen, etc) is not working very well this time through. I was craving Cafe Rio this afternoon; since we will shortly be Cafe Rio-less I indulged my craving. As we stood in line for lunch, the cooks yelled "Extra Meat" or "Extra Cheese" when someone orded extra this or that. Well, Miss Amelia loves cheese! She caught on to the enthusisam after the first yell. There after she merrily, chirped in " ex Cheese!!" with gusto. The workers were so enthralled they gave her quesidilla free. LOL! Awesome. Bold the ones you've done.Then tag others. What are your results?I tag whoever reads this! I called the moving company and scheduled a date for them to come pack and move our belongings. The reality of moving is slowly starting to sink in. The movers will pack up the house on the15th and move it to storage on the 16th. Friday evening Justin and I decided it would be best to just pack and move now instead of waiting for our house to sell. This is a real leap of faith since we do not have the resources to pay two mortgages or the townhome mortgage plus rent. Pretty much we will be using the entire Cabela's sign-on bonus as mortgage money instead of other fun things like a new Mac, decorations, ATV, etc. We did find out AT&T has coverage in Sidney so Justin wants an iPhone. Good for him! Just as long as I can play with it during church as often as he will!!! Today I accomplished quite a bit. 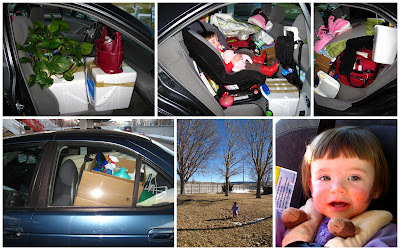 I sorted through three closets, the junk drawer, and packed some kitchen gadgets then took the lot to the storage unit or the DI. Miekka met us at the Murray DI for an hour of deal finds. I ended up with two books, not my best day! Amelia seems to always poo at the DI, no matter the time of day 15 minutes after we arrive she lays a stink bomb. You think I'd be prepared? No, I HATE carrying diapers and wipies in my purse. My car is stocked but not my person. De-bo (or Da-boo in Amelia) came over and helped me scrub the baseboards on the first level. It did make a tremendous difference. Amelia is growing like a weed. She talks up a constant storm. Her new favorite game is to chase De-bo around the coffee table and pretend to be a horse. She loves it when I sing the William Tell Overture as she neighs and crawls around. Today she even wanted me to feed her some hay!! Her language skills baffle me each day. She has a little cold so was having difficulty breathing so I used the booger snatcher to clear her nose. First, it is NOT easy to suction a toddler's nose. Second, it was even harder when said toddler is screaming, "No, Mommy, no nose, no boogies!" She thinks Justin is living at the church building once he left on Saturday. She wandered the whole building on Sunday calling for Daddy. 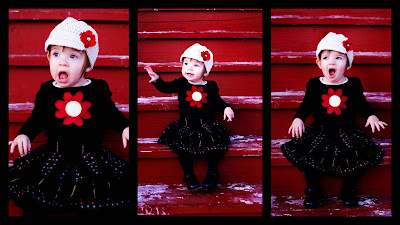 With her new cute outfit, thanks Miekka for finding the skirt, me new applique and hat, she was so scrumpy yum-yum.